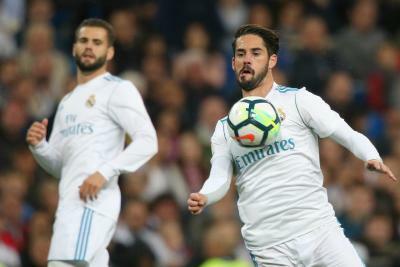 Madrid, Oct 23 (IANS) Barcelona, Valencia, Real Madris and Atletico Madrid won their respective games on the ninth day of the La Liga football league. Real Madrid equalled their best home win of the season as they beat Eibar 3-0 in the Santiago Bernabeu to remain five points behind FC Barcelona, reports Xinhua news agency. Against a rival struggling for form and with key players out through injury, Madrid, on Sunday, didn’t look back after Pablo Oliveira’s own goal put them ahead after 18 minutes. Marcos Asensio doubled Madrid’s lead after 28 minutes and they were comfortable in the game until Marcelo netted Madrid’s 3rd with 10 minutes remaining. Atletico Madrid won 1-0 away to Celta Vigo thanks to a solid defensive display and a first half goal from Kevin Gameiro in a game in which they were happy to surrender possession to a rival who deserved more for their efforts. Athletic Club Bilbao coach Cuco Ziganda could be in trouble following another dreadful display from his side, who lost 0-1 away to Leganes thanks to a Claude Beauveu goal. The result comes on the back of another poor performance in the Europa League and leaves Ziganda severely questioned. FC Barcelona continued their fine start to the season on Saturday night as Ernesto Valverde’s side beat Malaga 2-0. Barca went into the game just two days after their Champions League win against Olympiakos and Valverde rested Gerard Pique to allow Javier Mascherano to come into the side. Gerard Deulofeu opened the scoring with his first ever competitive goal for the club after just two minutes with the Malaga players complaining the ball had gone out of play before Lucas Digne provided the final pass. Malaga lost striker Diego Rolan with a hamstring injury before Andres Iniesta’s first league goal in a year in the 55th minute sealed a win which would have been bigger had Luis Suarez not missed an open goal towards the end. Valencia are second, just four points behind Barca as they won their fifth successive game with a 4-0 thumping of Sevilla, who have now lost their last three matches. Goncalo Guedes produced a spectacular individual display, scoring twice and giving an assist to Santi Mina, with Simone Zaza also getting on the scoresheet with his 8th goal of the season. Villarreal took an important step towards the top 6 when they thrashed a hapless Las Palmas 4-0, with all of the goals coming after the break. Cedric Bakambu continued his excellent form with the opening goal, with the other goals coming from Mario Gaspar, an own goal and Nicola Sansone. A first half goal from Antonio Sarabia and an own goal from Alexis gave Betis a 2-0 win at home to Alaves, who remain rooted in the relegation zone with just 3 points from 9 games. The day kicked off with Levante and Getafe sharing the points in a 1-1 draw in which Faycal Fajr opened the scoring for the visitors before Jose Luis Morales equalised just four minutes later.